Running your own business has many benefits including a lot more flexibility in your daily schedule. While I log a considerable amount of hours during the week, they don’t have to fit into the standard corporate hours of 8am – 6 pm or whatever the norm is. Even with a more flexible schedule, there is something special about Friday afternoons. The weekend horizon is that much closer and life just gets a little better. Time for some relaxation. Uncorked Ventures continues to grow. More and more customers are finding their way to us as word gets out about the fantastic wines we are offering. The feedback from our current customers has been overwhelmingly positive, with some customers increasing their wine club purchases. Our sales to restaurants have ticked up and within the next few months we will look to take on a few more clients. All in all we are heading in the right direction. It will be interesting to see where we end up this year. We have a few initiatives we are working on that should really help us grow in the coming months. Needless to say, I am proud of Mark and I as we navigate our way through starting our business. This week began what will be several weeks in a row we have visitors. My parents arrived on Wednesday and stayed through Saturday morning. While I wasn’t able to stick to my normal routine including exercise and focusing a good amount of hours on Uncorked Ventures, it was an enjoyable week none-the-less. Saturday morning marked the arrival of my sister. She traveled to the bay area to attend a friend’s wedding while also fitting a good amount of time in to visit with me and my family. With the excuse of my sister being in town, I took it upon myself to light up the grill once again today. The weather was perfect, somewhere in the mid-60s and the backyard is starting to take shape once again as the leaves are returning to many of my Japanese maples and other trees. 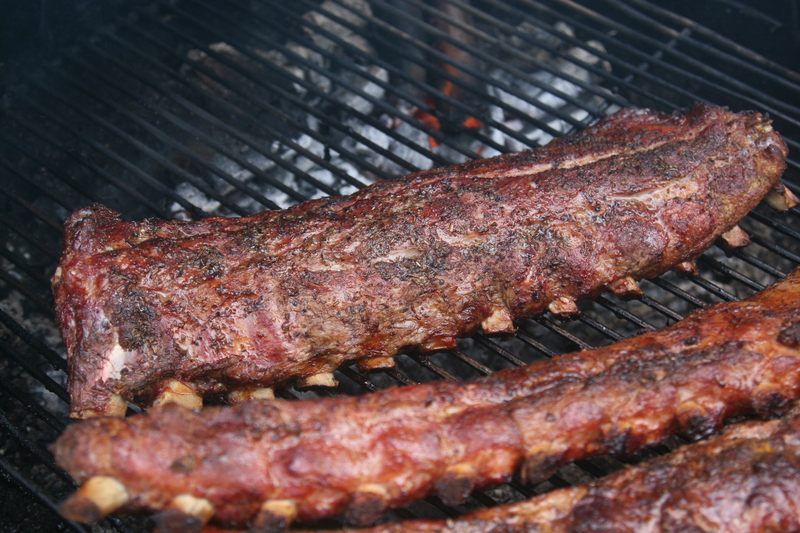 With the sound of the NCAA tournament in the background, I lit up the bbq in preparation for the three racks of baby-back ribs that were in need of some smokin’. There are moments in time when all things seem perfect (or at least good enough) and for me, it happens to be when I am bbq’ing in my backyard. Something about hot coals, being outside, and usually a tasty beverage in hand just puts my mind at ease and allows me to be in the moment. Today was no different. 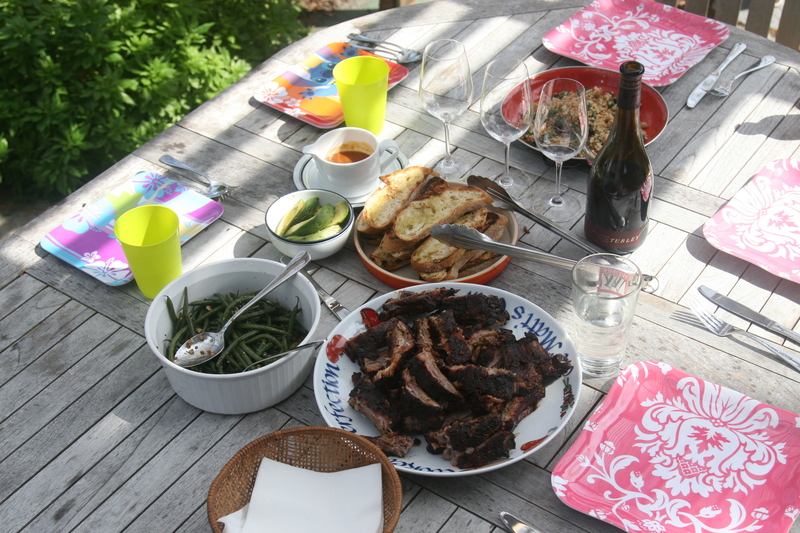 Besides the baby-back ribs, we were treated to a green bean pecan salad, middle-eastern couscous, grilled bread, a bottle of Turley zinfandel, and some homemade lemon bars. We have a 30 – 40 year meyer lemon tree in our backyard that aides in the creation of wonderful lemon bars as well as incredible mojitos and margaritas. All in all this has been a great week with today’s late lunch / early dinner being a nice way to cap it all off. I just wrapped up an enjoyable late Saturday morning breakfast with friends of ours who came down from their San Francisco home to spend a portion of their morning with us . While we were the ones doing the cooking, our friends were kind enough to bring us some wonderful pastries from Tartine, which happens to me one of my favorite bakeries in the bay area. While sipping on Peets coffee and munching on waffles, chicken apple sausage, and some fine pastries we spent a couple hours catching up with our friends and hearing about what they are up to while also sharing with them what’s going on with us. Come to find out, one of our friends left the law firm he was employed at to start his own practice at the beginning of this year. Of course having made a similar decision last year to start my own business, I was curios to find out what motivated him to make this decision and I also wanted to hear how he was doing in general. His motivation to strike out on his own is quite similar to other entrepreneurs, he wanted something that he could call his own and he was/is confident that he could do it better than others. Our friend is bright and talented, but most importantly he is willing to hustle. While there are a number of factors that contribute to the success or failure of a new business, I firmly believe that one’s ability to put in the hours and hustle for business can often make or break the new venture. From my conversation with my friend, I am confident he will make a successful go of it. My friend works out of his “home office” which is currently an unfinished basement-like portion of the apartment building they live in which gets no heat and has only one power outlet. The fire inside of him to build his business and provide for himself and his family is what keeps him warm. In the coming weeks, I plan to check in with my friend and will probably head up to the city to have a cup of coffee with him and see how things are progressing. As a small business owner, I am drawn to others who also have taken the leap to start something of their own. I can relate to the highs and lows you feel. I understand what it feels like to be spending money with the intention of one day turning a profit. I understand that passion and determination are some of our best friends. As far as Uncorked Ventures, we continue to make strides on several fronts. We have added a few more fantastic wines to our on-line store. I continued to be please with the partnerships we are establishing with top quality wineries. The visits to wine country are definitely paying off as they allow us to get to know the winemakers, find the hidden gems, and build relationships that get us access to these limited-quantity, high-quality wines. On another front, we have had several customers begin to use us for their personal and corporate gift giving. We are happy to go the extra mile to ensure special wines are delivered along with a personal note from our customer. With just a few clicks we take away the hassle of tracking down that ideal gift. Okay, I am ready to go back to enjoying my weekend. Our February wine club shipments began arriving at folks doorsteps this morning. Our customers should be happy as we picked out some special wines for them this month. While I can’t say that packing up the shipment boxes myself is something that I look forward to, I do get a level of satisfaction from the process of grabbing the bottles and placing them in the box. For whatever reason, seeing the wines we picked out along with a copy of our newsletter in each customer’s shipment box makes me proud. We ship what we like and what we would be happy to receive ourselves. While our most recent trip to the California Central Coast is in our rear view mirror by about a week seeing the wines we picked up in our warehouse is a reminder of how good some of the wine being produced in Paso Robles and Santa Barbara county truly is. That being said, we did taste our share of wines that did nothing for us. In those situations, we are polite and just hope that the next wine they pour is better. If nothing appeals to us, we thank them for their time and move on. Winemakers and the other folks at each of wineries we visit generally are trying to make good wines, but not every wine can be great. Thankfully, people’s palates are different which leaves room for a lot of different wine to be produced. That being said, I am interested in the good stuff and not much more. Speaking of good stuff, I need to head out the door and go grab a late breakfast / early lunch and one of my favorite spots here on the Peninsula. Turns out, that we are going to partner with them to develop and execute a revamped wine list for their two restaurant locations. This isn’t the big focus for us, but I am happy to work with great people who are interested in taking care of their customers which includes providing them with better wine choices. Take care and if you want to check out what wines we have been shipping to our customers, check out the individual wine club pages on our website which list some of the wines we have recently shipped. Lastly, we are beginning to offer certain wines for purchase on the Uncorked Ventures‘ website to the greater public. This is outside of our wine club offerings. 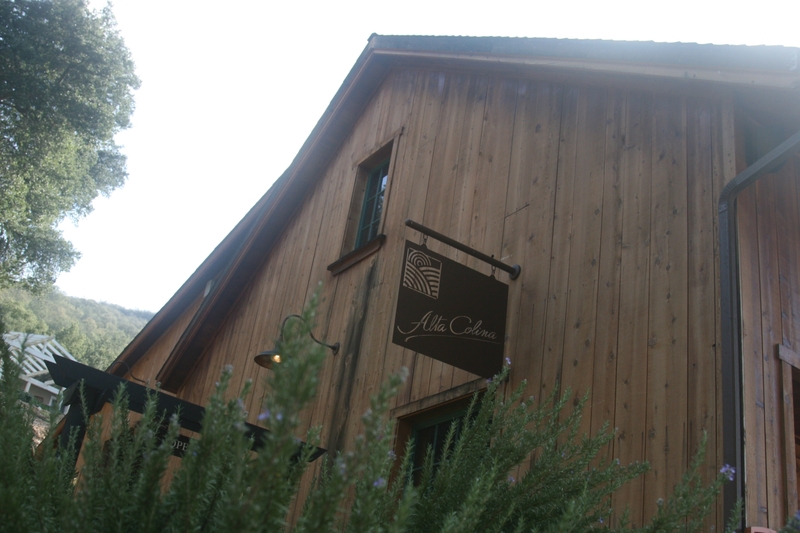 Over time we will expand our offerings as we are only starting with three wines. The focus of these wines offered in our on-line wine shop will mirror the wine clubs focus which is incredible tasting, hard-to-find wines. Have a good day, I plan to. It may be Ground Hog’s Day, but unlike Bill Murray in the movie Ground Hog’s Day, I definitely don’t feel like I am stuck in rut – repeating the same day over and over again. If anything, I feel like I am riding a tornado, which happens to be my new business, Uncorked Ventures. Four weeks ago today, my business partner and I sent and email out to our family, friends, and contacts launching our new business. The response to our email has been great. Family and friends have been very supportive in helping us build our customer base. The support we have received has truly warmed my heart as not everyone who has joined one of our wine clubs is into wine. In return for their support, we shipped out some exceptional wine in January to our new wine club members. While packing boxes and creating and affixing shipping labels doesn’t sound exciting, it is when you are shipping product to your initial customers. It helped me feel connected. To realize that what I was putting in that box would soon be in the hands of one of my customers was a thing of beauty. It is a moment I don’t think I will forget anytime soon. I was so proud at that moment, that I even snapped a picture of the boxes stacked on one another while I waited for the shipping company to come pick them up. Beyond our first shipment, we have made lots of progress in other areas of the business. We continue to put the time and effort into our on-line foot print. New content is being added to our website on a weekly basis including some new videos from a recent trip to Napa. Expect more of these videos as we are heading to California’s central coast in a couple weeks to meet with many more wineries as we continue to identify and source exquisite hard-to-find wines for our customers. Frankly, it will be nice to shed the gray Northern California has been blanketed in for what seems like months and enjoy some sunshine and the company of some of California’s best and most innovative winemakers. As we look out over the next few months, we will continue to focus on 2 key primary objectives. First and foremost, we will work to grow our customer base by many different means. 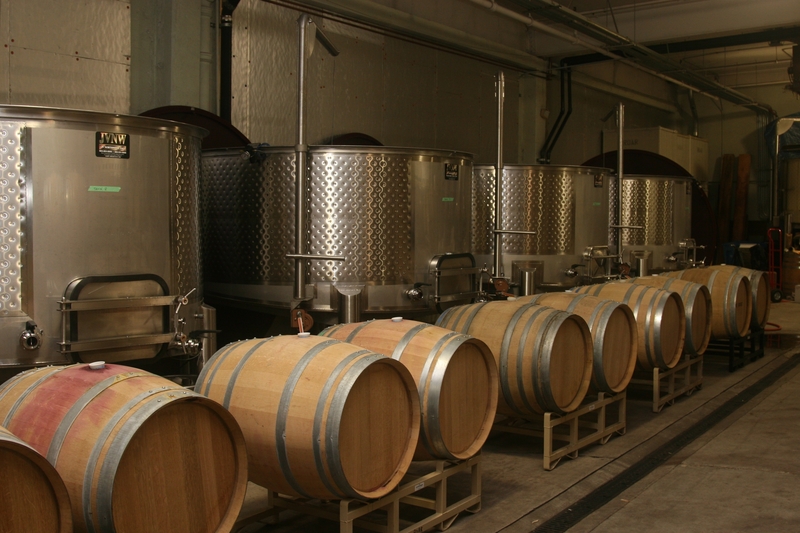 Secondly and equally important, we will continue to bring the great and interesting wines to our customers. We realize that we could probably make more money if we only focused on the first objective, but that would not satisfy us. Yes, we need to make a living and help support our families, but we also need to remain true to ourselves and the reasons why we launched this company. I hope your Ground Hog’s Day has been as exciting as mine has been. I look forward to updating you on our progress again soon. We are three days into launching our business to the wider public, so how are things going? I have to say things are going well. We have picked up several customers with hopefully more on the way. It is good to have friends who are supportive of the new business and what us to succeed. Uncorked Ventures has also kicked off our affiliate marketing program which should help spread the word about our wine clubs and other offerings to many more people. The internet is huge so it helps to have more than just our voice extolling the virtues of our offerings. I’m please with how our new website turned out. If you saw our original website, you know we have come a long way. We do have some tweaks we want to make and more content will be added as the weeks and months progress. I don’t think we will ever be done with the website as we will continue to strive to make the user experience better and better. The best part of our launch for me has been the opportunity to reconnect, if only by e-mail, with some of my friends and old co-workers. Yesterday I had two separate phone conversation with a couple friends I hadn’t spoken to in sometime. They both called to congratulate me on the launch and let me know that they wanted to throw me some business. The congratulations would have been enough, but I can’t say the business isn’t welcome too. Thank you friends. So all in all, things are heading the right direction. I hope your new year is starting off in a positive direction as well. 2009 turned out to be pretty transformational year for me and my family. Things got going early in the year as I left my corporate HR job the first week of the year. After 13+ years of doing HR work, it was time to try something new, but what? After taking a few months off which included a trip down to Peru a little clarity settled in and I decided to pursue my passion for wine by starting a business focused on wine. After a substantial amount of due diligence, my brother-in-law and I started Uncorked Ventures. 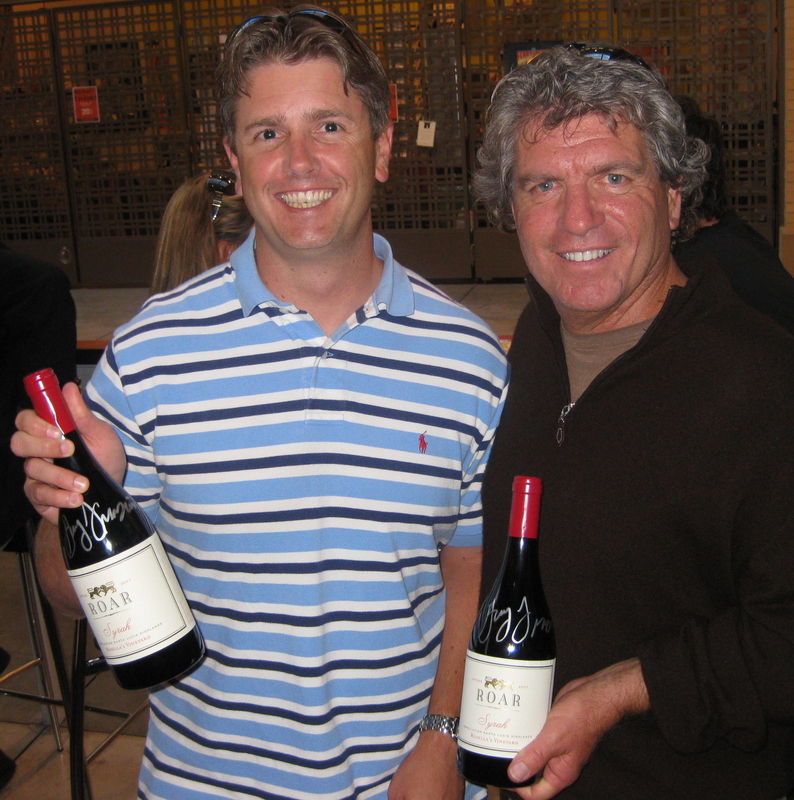 Our focus would be to bring exciting and great wines to individuals across the US via our wine clubs. As we stand on the verge of 20101 our long hours have been rewarded as we prepare to send out of grand opening announcement emails. While getting the business off the ground was more complicated than we fully anticipated, it has been an enjoyable and mind expanding. I have much more respect for my fellow small business owners than I had prior to beginning this adventure. I am also thankful for my business partner/brother-in-law. Having someone to rely on and share the ups and downs makes the journey bearable at times and down right pleasurable at other times. Starting Uncorked Ventures has been transformational not just on the work front, but also on the home front. Eliminating 2 hours plus of commute time from my day has been freeing. Working from home several days a week has also allowed me the opportunity to interact with my kids much more. I feel like I know each of my kids better and that they enjoy having me around more. My kids are growing up fast and I am glad I am enjoying them now. My sons has already proclaimed that he wants to sell wine like daddy when he grows up. As this year ends, I feel more alive and refreshed. I hope that all the hard work pays off and that customers make their way to our website. Here is to the new year and all the possibility it holds for me and my family and hopefully for you as well.